View More In Washcloths & Towels. Are your kids stealing blankets and wearing or dragging them around the house? Do your toddlers need help transitioning from warm days to crisp mornings and chilly evenings? A lot of robes are made of cotton, which is thin and chilly. Even worse, a lot of toddler robes are plain and boring! 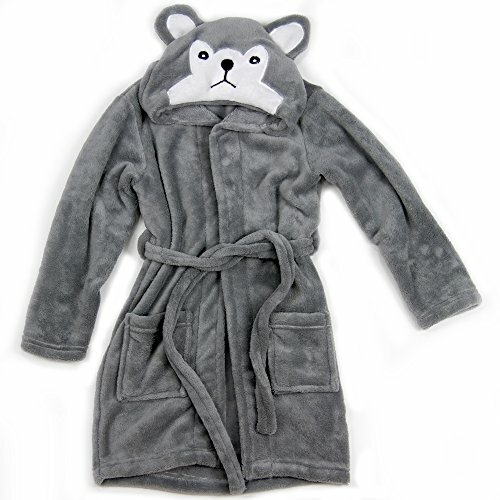 Kids CozyRobes from Happy Healthy Parent have a fun animal hood that makes kids smile! Made with all fleece, our robes are warm and cozy while being super cute! Our hooded robes are designed to be durable and machine washable! They can stand up to your kids' playtime! Also, fleece is naturally soft and comfortable, so toddlers love wearing them! They may not even want to take them off! Wrap-up and Play! - No buttons, zippers, or velcro. Easy to put on and tie with the provided belt. These robes fit children approximately 25lbs to 45lbs or sizes 2T to 5T. You will get our LIFETIME GUARANTEE because we are confident that you are going to love our Kids CozyRobe! Click the ADD to CART button at the top right of this page to get your cute hooded robe today! If you have any questions about this product by Happy Healthy Parent, contact us by completing and submitting the form below. If you are looking for a specif part number, please include it with your message.